Welcome to the idea gallery, a place where you can get the inspiration you need to create or finish a project. Click on the image to read my post for more details, or if you're ready to make a photo book like mine, just click on the company logo! I loved making my first custom ABC book. I had the template already made so I made another, but with photos from our Disneyland trip. It was fun tracking down photos for all letters of the alphabet. Thank goodness there's only 26! A great gift idea! This is with a lay flat upgrade (+$25.00). I also upgraded to a matte cover. 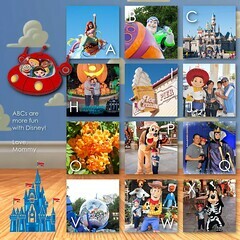 I loved making this personalized ABC book for PhotoBookBaby. He loves it. Would make a great gift for grandchildren, nephews, nieces and new parents too! This was of my second born's 100 days birthday - a traditional Chinese celebration. This would also easily work for a baby milestone book, or baby birthday photo book as well! Remember your little one's early days while you can - they grow up so fast. Makes a great gift for grandparents too. 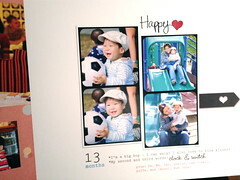 This book was made with a free template from Shutterfly so it was easy and stylish. 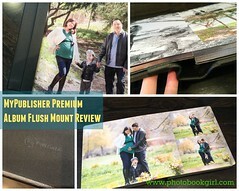 My first premium lay flat photo book with Shutterfly! This was a Valentine's Day gift to the grandparents. I included my baby's first milestones for every month. Baby's first year is worth recording! Make a stylish book with your best shots of the year. 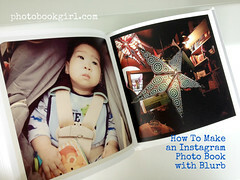 Find out all my best tips for making a book like the one I made for my little guy. This is a great little book to record all your baby's guests either at home when he gets his first vistors, or at his first birthday party. A guest book can also be a great gift for an expectant mother at her baby shower. Even though you won't have shots of baby yet, you can fill with photos of her and her growing belly, possibly ultrasound photos etc. Also leave a space to record the gifts baby got for an extra special keepsake! 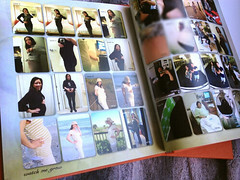 A photo book is a must to memorialize the joy of being expectant parents and all the baby shower fun! I had so much fun at my co-ed baby shower being surrounded by all our friends and family. You'll want to remember all of the details from your child's birthday party. Here's my son's 2nd birthday pirate party! This book is a lay flat book, quite hefty in size. Features thick cardstock pages and comes in a presentation box. 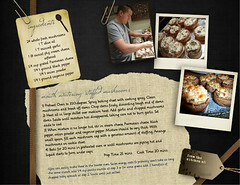 Put all your family's or friend's best recipes into print. 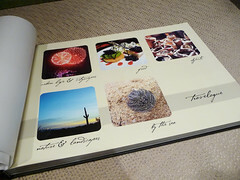 Add family photos, pics of mouthwatering food and this book is bound to be a cherished keepsake. 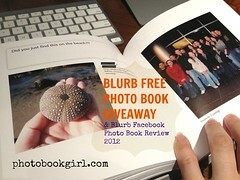 Also features tips on doing a collaborative group photo book. My Disney trips are always full of fun photos, especially when you get a professional photo package from Shutters. I couldn't fit all the photos into one book so I did a two-volume set. 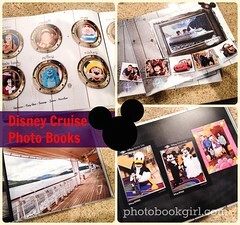 This features a lay flat photo book of our Alaskan cruise. 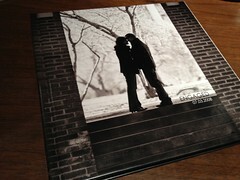 Besides wedding photos, don't forget those engagement/e-session photos! 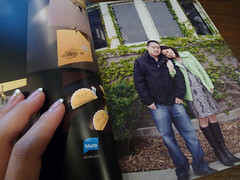 This high quality lay flat book is printed on real photo paper. I have an exclusive 20% off coupon from BrideBox - more details in the post! Memorialize those funny photos and comments from your friends with this new and easy photo book app that instantly slurps your Facebook into a printed book. 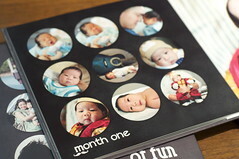 A step-by-step guide on how to start a family photo book project as well as ideas on types of family photo books you can make such as cookbook, memorial book etc. This lay flat photo book is printed on real photo paper and lies flat. Makes for a great gift. This one happened to be a milestone birthday gift for a grandparent featuring all the grandkids. Top tips for making a guest photo book for any occasion with specifics on the best paper and smudge-free pens to use. 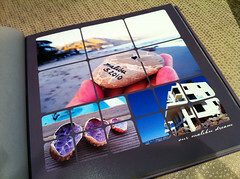 Put your Instagram photo stream into print! This new and easy app will automatically pull photos from your Instagram and plop them into a neat little book. Chronicle every step of the way with those fun baby bump photos! Is the mom-to-be too busy? Imagine how excited she'll be to have a special photo book of her 9 months made for her? Our last photo book as a trio. A maternity photo shoot is a great time to also have a family photo shoot. I loved all the adorable baby bump photos of kids with their sibings-to-be that I saw online and had to have some of my own. For this one, I let the company do the design - a welcome change of pace during a busy time as a mom of two! 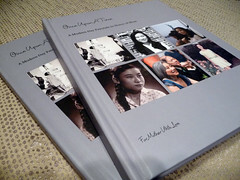 Tips on making a photo book for mom, dad, grandma, grandpa or any family member you cherish. Also features a review of Blurb's Proline and premium papers to help you decide what paper is best for your book. 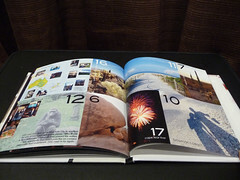 This large landscape book is a great size to show off your best photos. This book would make an attractive way for pro photographers to showcase their work. This also makes an ideal coffee table book for the hobbyist as well. Mine is out on in our living room! 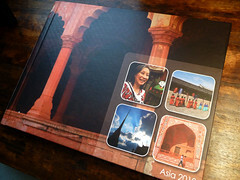 Capture the best memories from your vacation with this lay flat photo book. Also find out about making a multi-volume series of books. 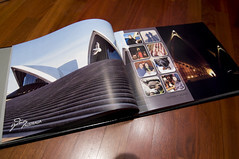 A review of MyPublisher's Deluxe photo book in leather and tips on how to make your custom layouts. Check out this lay flat alternative to the pricier flush mount books. The bright and high quality printing will fool you into thinking it's real photo paper (it fooled me) but it's not! I've got an exclusive 20% off coupon code for this book! Click on image for details. Make a wedding guest book using your engagement photos! 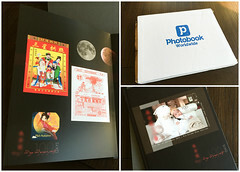 A wedding photo book great for parents' albums! 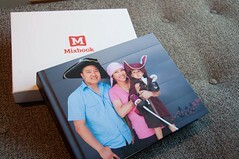 If you have it in your budget, this is the nicest type of photo book out there - a flush mount album. Lay flat, very minimal gutter and printed on real photo paper mounted onto a hard board backing. Perfect for heirloom books and special occasions. Year in review or yearbook photo books are a great way to remember the highlights of the past year! Designer pre-made templates from Shutterfly offer a quick and stylish way to make a yearbook. They've done all the layout work, just upload your photos and drag and drop.